Rashed Belhasa the son of an affluent businessman never fails to surprise the world by his inherited extravagant wealth. 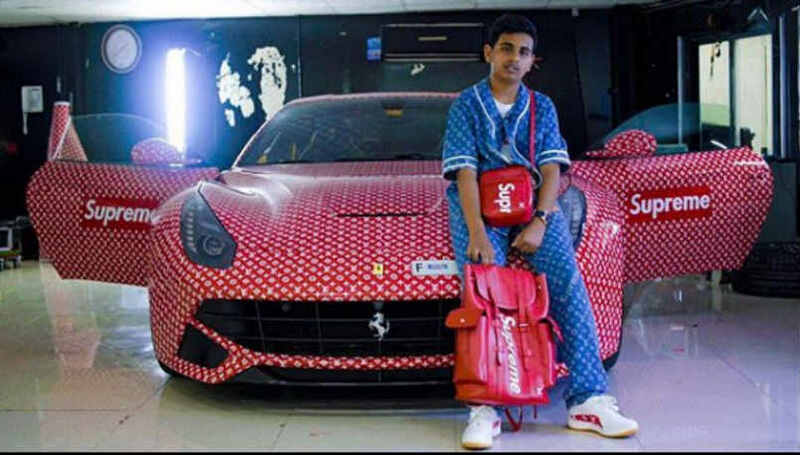 The 15-year-old teenager is an avid car collector and he has shared some photos of his Ferrari covered in Supreme and Louis Vuitton print. In case if you don’t know, then let us tell you Supreme is a popular clothing brand of New York and Louis Vuitton is a France-based designer bag retail chain. The son of businessman Saif Ahmed Belhasa cannot drive the cars on the street of Dubai as the legal age of driving in the ‘Gold City’ is 18 years. Rashed Belhasa is also known as Money Kicks created a vlog where the entire process of the car wrapped in the Supreme and Louis Vuitton print is shown. The young boy is seen in the workshop wearing head-to-toe Supreme and Louis Vuitton. And at the end of the video, Rashed is seen getting in the passenger seat of the car and driving away. This is not it. He even leads luxurious lifestyle. He pets a tiger at his home and enjoys his life with film stars and celebs. He also owns a milk shake brand named ‘MoneyKicks milkshake’, reportedly available at Alison Nelson’s Chocolate Bar store, which is a part of his dad’s business. The 15-year-old boy spends around $5000 (18365 AED) on his clothes each month. He has a total of 200,000 pairs of sneakers and once he paid $8000 for a pair of sneakers. He also has a small zoo at his place, which houses 50 lions and a bunch of leopards, cheetahs, and panthers.